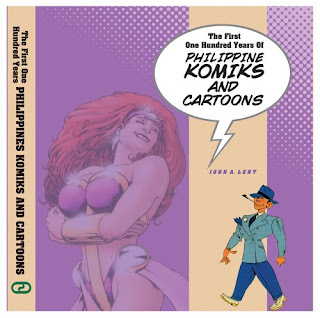 “THE FIRST ONE HUNDRED Years of Philippine Komiks and Cartoons” coffee table book will be launched on Oct. 16, 2009 at 5PM at the Powerbooks, Megamall. Written by Dr. John A. Lent of Temple University and published by Yonzon Associates. Painstaking data and visual research.Size: 10” x 11” (bigger than usual), in glorious full color, 156 pages to be exact. Three main chapters by Lent, supplemented by other writers Doy del Mundo, Orvy Jundis, Glady Gimena, Manny Auad, Beth Chionglo, Aileen Casis, Guia Yonzon and me. Prize is only P1,500., just the price of a US graphic novel. For those who will make reservations and pay before the launch date, we will give 20 percent discount. Just get in touch with Gwiz or me.It’s a whole 100 years gallery from Jose Rizal to the present day Pinoy artists. This book will make you proud of who we are in the comics dome! I didn’t realize too until we got into it.Here is one version of the cover, the jacket. And some sample spreads.